Note: Tel Rumeida is a Palestinian area in the centre of Israeli-occupied Hebron. For a graphic description of what life for Palestinians is like there follow this link. The attitude of the Palestinian owner of the lease on the orchard is extraordinary: he looks back to previous decades when Jews and Palestinians lived in peace and friendship in this area. On 5 January 2014, CPTers learned that a bulldozer had begun leveling a large tract of almond orchard for the expansion of the Tel Rumeida settlement complex on the previous evening. Two CPTers visited with Hani Abu Haikel, long-time CPT partner, on 7 January to learn more details. According to Abu Haikel, his family has held a 99-year lease, of which twenty-five years are left, on the orchard that was demolished to create the outpost. The Abu Haikels had originally leased the land from the Bajaio family, Palestinian Jews whose family the Abu Haikels sheltered during the Hebron Massacre in 1929. Then they leased the land from the Jordanian government, which governed the area after 1949, and the Israeli government after 1967. The Israeli government has blocked the lease Abu Haikel’s family holds on this area in order to allow the settlers to continue construction on this new, outpost. 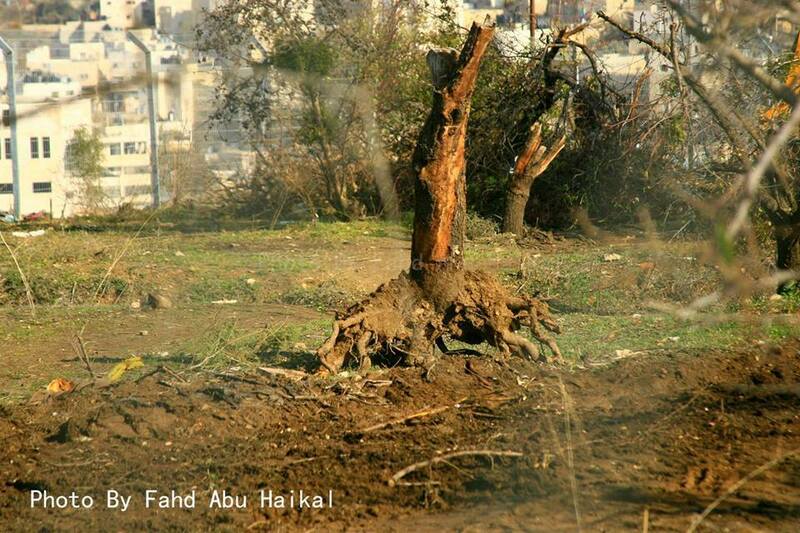 Police arrested Abu Haikel and his cousin on 5 January for being in a ‘closed military zone’ when they asked by what right the settlers were destroying their mature almond trees. They then banned the two men from going within 250 meters of the site. Abu Haikel is nostalgic for past centuries when Palestinian Jews and Muslims lived in more harmonious ways than is possible with the current Israeli settlers living in Hebron. His grandfather’s business partner was Jewish and they would take turns on Friday and Saturday looking after their shop. He remembers that his own family used to light candles on Friday evenings. He continues to maintain contact with descendants of the Bajaio family and has an extensive network of Jewish friends in Israel and abroad. When one of the CPTers interviewing Abu Haikel said he had noticed some frightened looking construction workers in the van when he was walking up to visit, Abu Haikel told him they were Palestinian. When asked how he felt about their collaboration with the settlement enterprise, Hani Abu Haikel said it was a matter “for their conscience,” and that he would just as soon the work go to a Palestinian worker as someone from Thailand. “Soldiers come here with fear in their eyes,” he said, “They are told by their commanders that the women carry knives and the men carry guns.” Abu Haikel found this information out when he asked a soldier, “Why are you frightened of me?” Afterwards, they had a three-hour conversation. The soldier was reassigned to another checkpoint the day after and they did not speak again. Under international law, it is illegal for Israel to move populations into military-occupied territory. The Israeli government therefore does not have the right to terminate the Abu Haikel’s rental agreement, to destroy their trees, or to offer the land to Israeli settlers. People wishing to follow developments on the Tel Rumeida situation should check out the Save Tel Rumeida Facebook page, run by the families who live there and their supporters, Christian Peacemaker Teams Palestine will also continue to post updates on its Facebook page. BETHLEHEM (Ma'an) -- Israeli human rights group B'Tselem on Wednesday released video footage which shows Israeli soldiers standing among settlers while they attack a Palestinian school with stones in the Nablus village of Urif. The incident took place on Monday when a group of settlers raided the village and started throwing stones at the Safadi family home, adjacent to the site of a USAID funded water reservoir project. The settlers then threw stones at a village school. The video footage, which was filmed by local resident Usama Safadi, clearly shows settlers throwing rocks in the presence of Israeli soldiers. "The soldiers took no measures to arrest the settlers, to remove them from the area, or at the very least to put an end to the stone-throwing. Several students at the school threw stones back at the settlers and the soldiers fired teargas at the students," B'Tselem said. The settlers appeared to also be accompanied by a security guard from a settlement. After 50 minutes, the settlers left the village and headed in the direction of Yizhar settlement. The settlers passed several military vehicles on the way out and no attempt was made to arrest them or identify them. "The filmed record of the incident indicates that the soldiers acted with disregard to their duty to protect the Palestinians: they did not put an end to the violent acts they witnessed, responding only when Palestinians threw stones back at the settlers," B'Tselem said. The incident shows that the Israeli military served as a "security entourage" for violent settlers, whereas their responsibility is to defend Palestinians in the West Bank, B'Tselem added. The rights group said it plans to apply to the relevant authorities to demand an investigation into the incident which examines the conduct of the Israeli soldiers and officers during the events.